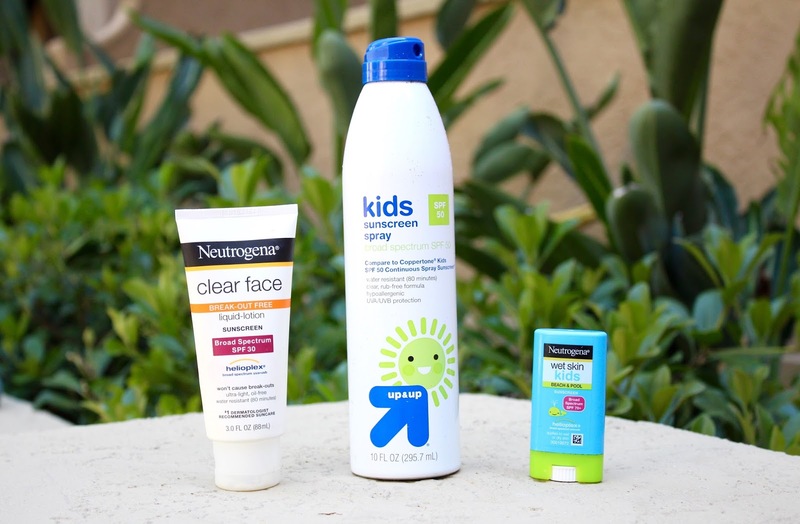 LOVING LATELY... SUNSCREENS! | jeni a. To my greatest joy, we are in the sun A LOT. Between the pool, beach, and park, I lather us all up daily. I've been using the Neutrogena Clear Face Sunblock Lotion on my face since May, and I've never had sunscreen as part of my day-to-day till now. My former-model, law-school sister, Elizabeth, inspired me to get on this train. She's a California girl - she grew up in the sun - and yet her skin is beautiful. It's so healthy! I've loved the Neutrogena lotion here - I haven't burned at all, and yet my freckles are consistently emerging!! As for the girls, I've been totally pleased with that Target sunscreen. My surfer friend said that spray sunscreens are great, by the way, just re-apply them sooner than the lotions. That made me happy to hear, because if we were lotion'ing every time...we'd probably die. I also found that tiny Neutrogena Wet Skin Kids Stick for them this week and I'm sold on this one. Olivia has been getting the smallest-ever burn under her eyes; Claire has a scar on her forehead that needs good coverage (remember our crazy, yet still good, trip to South Carolina HERE and HERE??) so I needed something that I could really control when applying. One week down with that little guy, and Olivia's had no redness! And Claire has let me cover her face much easier. And it smells good. Big wins. Happy Friday! And 4th of July weekend! !